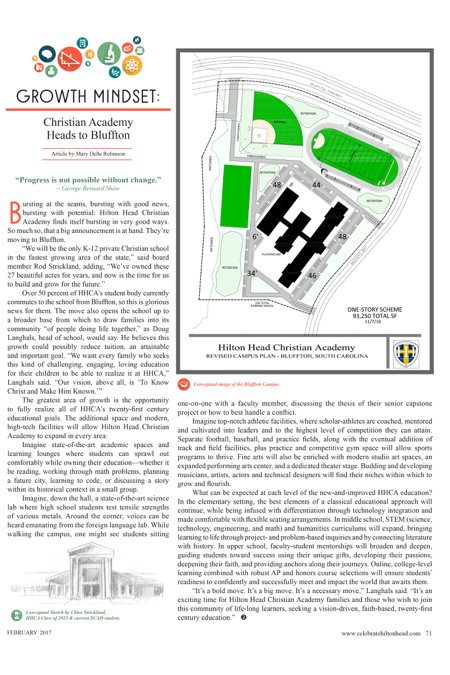 Bursting at the seams, bursting with good news, bursting with potential: Hilton Head Christian Academy finds itself bursting in very good ways. So much so, that a big announcement is at hand. They’re moving to Bluffton. Imagine state-of-the-art academic spaces and learning lounges where students can sprawl out comfortably while owning their education—whether it be reading, working through math problems, planning a future city, learning to code, or discussing a story within its historical context in a small group. Imagine, down the hall, a state-of-the-art science lab where high school students test tensile strengths of various metals. Around the corner, voices can be heard emanating from the foreign language lab. While walking the campus, one might see students sitting one-on-one with a faculty member, discussing the thesis of their senior capstone project or how to best handle a conflict. Imagine top-notch athletic facilities, where scholar-athletes are coached, mentored and cultivated into leaders and to the highest level of competition they can attain. Separate football, baseball, and practice fields, along with the eventual addition of track and field facilities, plus practice and competitive gym space will allow sports programs to thrive. Fine arts will also be enriched with modern studio art spaces, an expanded performing arts center, and a dedicated theater stage. Budding and developing musicians, artists, actors and technical designers will find their niches within which to grow and flourish. What can be expected at each level of the new-and-improved HHCA education? In the elementary setting, the best elements of a classical educational approach will continue, while being infused with differentiation through technology integration and made comfortable with flexible seating arrangements. In middle school, STEM (science, technology, engineering, and math) and humanities curriculums will expand, bringing learning to life through project- and problem-based inquiries and by connecting literature with history. In upper school, faculty-student mentorships will broaden and deepen, guiding students toward success using their unique gifts, developing their passions, deepening their faith, and providing anchors along their journeys. Online, college-level learning combined with robust AP and honors course selections will ensure students’ readiness to confidently and successfully meet and impact the world that awaits them.